Running dog of the Rajapaksa regime,Mervyn Silva has threatened to break in public the bones and limbs of Journalists and Human Rights Defenders who had allegedly worked against the Country at the United Nations Human Rights Council(UNHRC) in Geneva. The Minister of Public Relations in the Rajapaksa Government made threats at a public meeting held in Kiribathgoda to condemn the resolution against Sri Lanka at the 19th session of the UNHRC in Geneva. Mervyn Silva boasted publicly at the meeting that he was responsible for chasing out senior journalist Poddala Jayantha from the Country and warned that he would break the limbs of other journalists and human rights defenders regarded as traitors by him. The Gampaha district MP who hails from the Hambantota district named persons like Nimalka Fernando, Paikiasothy Saravanamuttu, Sunanda Deshapriya and Poddala Jayantha as traitors and threatened he would break their bones in public. The “Rajapaksa Rottweiler” stated openly that “even if a Tsunami flowed from Sigiriya, no Tsunami would flow against him from Rajapaksa” meaning there would be no action taken against him by President Rajapaksa. Referring to the President as the King of the Country Mervyn Silva said “ I know the sons of D.A. Rajapaksa from the time they were kids. The King of this country loves me, the King of this country trusts me”. “Minister of Public Relations Mervyn Silva warned that he will break the limbs of some journalists, who have gone abroad and made various statements against the country, if they dare to set foot in the country. “I’m the one who chased one of those journalists ‘PoddalaJayantha’ out of this country. I will break the limbs of all these journalists, in public if they dare to set foot in the country” the Minster warned. Speaking at a demonstration against the resolution against Sri Lanka at the UNHRC held in Kiribathgoda today Silva also said it is the only the President who can remove him from office. He also said “Even if a Tsunami flow from Sigiriya I’m sure that no Tsunami will flow against me from President Mahinda Rajapaksa” . “Only Mahinda Rajapakshe can sack me, no other big shot can lay their hands on me until that happened I won’t leave Kelaniya. I know the sons of D.A. Rajapaksa from the time they were kids. The King of this country loves me, the King of this country trusts me” he said. Public Relations Minister Mervyn Silva yesterday threatened to break the limbs of those who had campaigned against Sri Lanka at the just concluded United Nations Human Rights Council (UNHRC) sessions in Geneva. Leading a protest, at Kiribathgoda, against the passage of US-sponsored resolution, the Gampaha District parliamentarian declared that President Mahinda Rajapaksa had confidence in him and he couldn’t be even moved by a tsunami. Addressing the media covering the demonstration, the minister revealed that he was responsible for forcing Lake House journalist Poddala Jayantha to flee the country.Claiming that the people of Kelaniya were behind him, the MP lashed out at Sunanda Deshapriya, Nimalka Fernando, Poddala Jayantha and Paikiasothy Saravanamuttu for being involved in undermining the country during the Geneva sessions. Calling them traitors, the MP warned that he would break limbs of those traitors in public. The latest threat was made in the wake of the SLFP launching an internal inquiry into a simmering dispute between the MP and a group of Pradeshiya Sabha members representing the Kelaniya PS. The police are conducting a separate inquiry. 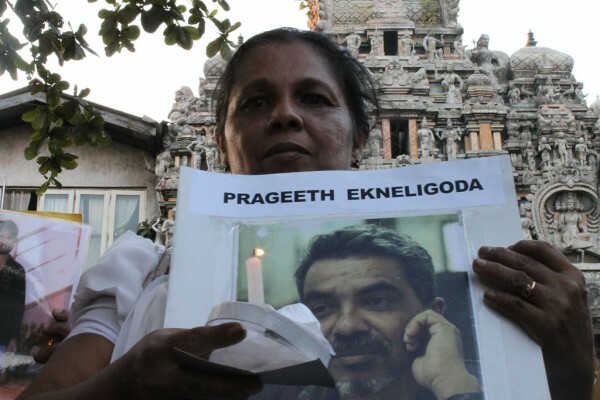 “Sri Lanka’s Killing Fields: War Crimes Unpunished’ alleged that the Rajapaksa government had killed many journalists and media workers, while forcing many to leave the country. “The High Commissioner for Human Rights Navanethem Pillay today warned that there must be no reprisals against Sri Lankan human rights defenders in the aftermath of yesterday’s adoption by the Human Rights Council of a resolution on Sri Lanka. Spokesperson for the UN High Commissioner for Human Rights Rupert Colville quoting Miss Pillay said that during this Human Rights Council session, there has been an unprecedented and totally unacceptable level of threats, harassment and intimidation directed at Sri Lankan activists who had travelled to Geneva to engage in the debate, including by members of the 71-member official Sri Lankan government delegation. Intimidation and harassment of Sri Lankan civil society activists have also been reported in other locations around Geneva. At the same time in Sri Lanka itself, newspapers, news websites and TV and radio stations have since January been running a continuous campaign of vilification, including naming and in many cases picturing activists, describing them as an “NGO gang” and repeatedly accusing them of treason, mercenary activities and association with terrorism. Some of these reports have contained barely veiled incitement and threats of retaliation. At least two comments posted by readers of articles of this type have called for burning down of the houses of the civil society activists named in the articles, and at least one such comment called openly for them to be killed. The High Commissioner has noted that some of the attacks on human rights defenders were carried in Sri Lankan state media and Government websites or were filed by journalists who had been officially accredited to the Human Rights Council session by the Sri Lankan permanent mission. She is calling on the Government to ensure the protection of human rights defenders, to publicly disassociate itself from such statements, and to clearly uphold the right of Sri Lankan citizens to freely engage in international debate of this kind. As the three Sri Lankan human rights defenders who have come most under attack by the state media in Sri Lanka in the past week, because of our active involvement with the on-going session of the UN Human rights Council in Geneva, we feel compelled to issue this statement of clarification. We do not deny that we are critical of the conduct of the government of Sri Lanka, and the institutions and agencies under its control, whenever disregard for the human rights obligations imposed on the government by virtue of its being signatory to almost all international human rights conventions comes to our attention. As the President of Sri Lanka, and his Special Envoy on Human Rights well know, the three of us have offered our services to this government to ensure human rights accountability in the past. For example, all of us served on the National Advisory Council appointed by Minister Mahinda Samarasinghe, when he held the portfolio for Human Rights. It is indeed regrettable that at a time in the history of our country when we have the opportunity to transform our society, to move from a post-war to a post-conflict phase, and to enjoy the support of the international community to rebuild a just, humane and prosperous Sri Lanka in which all its citizens can live together with peace and dignity, the government and its media have seen it necessary to launch into an unprecedented and utterly personalized attack against the three of us. There is no attempt to challenge us substantively on any point. None of the comments attributed to us, were actually ever made by any one of us; there are many who were present at the side events where we have spoken who can testify to that. Those who accuse us of bringing the country into disrepute would do well to examine both their own motives and the consequences of their actions. Instead of carrying on with advocacy for defeating the Resolution, Sri Lanka’s ambassador to the Council, Ms. Tamara Kunanayagam has had to spend hours of her valuable time talking to delegations, to the President of the Council and to officials of the Office of the High Commissioner on Human Rights about the campaign of intimidation and attack against Sri Lankan human rights defenders at the Council and in Sri Lanka. As human rights defenders working to defeat impunity in Sri Lanka and to build a strong system of justice and accountability for human rights violations, whether committed in the past or in the present, we remain committed to our ideals and to our goals. For us, whether there is a Resolution on Sri Lanka at the UN Human rights Council or not, our work to defend human rights in Sri Lanka must, and will, go on. This kind of reaction is expected. OMG, I don’t know why GOSL spent all that time and money in Geneva when they could have sent Dr. Mervyn Silva to UNHCR. He would have walked in, broken the bones of all delegates who were going to vote against SL on the resolution. That would have been the end of that! Then for good measures GOSL should send him to New York. He would get hold of Ban Ki Moon, tie him to a tree in the Central Park and that would be the end of all UN actions against SL also. You are a huge threat to Sri Lanka just like Prabha of course in a different way. Oh my! Need we say more. We rest our case. He has bitten many times and barks that he bit. He continues to bark that he will bite and will bite. It is time Mervyn is caged. The leash on him is a bit too long. He can yet bite occasionally. To call him a Rotweiler, is an insult to that breed! I have a Rottweiler. It is the best dog I have had. Has character, personality and intelligence. It does not like to be reprimanded, but learns fast not to do what is unacceptable. It is very lovable, though not cuddly. It is an animal with both muscle and brain. What impresses me is that he demands that he be treated as a member of the family in a quiet, but emphatic way. He wants to not only share my bed, but have a pillow as well! It is also unfortunate that the likes of Mervyn occasionaly produce results like stopping animal sacrifice at the Kali temple in Chilaw, stopping the dumping of garbage in the Muthurajawela swamps and forcibly taking over a brothel run near a school in Kelaniya. When law and order fail, men like Mervyn, become the law! A tragedy. The GOSL has to do a lot of house cleaning. If recent police lists on those in government engaged in crime are true, the process has begun. I hope it will continue. Let me adapt your sentiments about your Rottweiler “mutatis mutandis” to Mahinda and Mervin. “I have a Rottweiler called Mervin…. He is the best attack dog I have had. Has (negative)character, (Obnoxious) personality and (warped)intelligence. He does not like to be reprimanded, but learns fast how to do what is unacceptable to others but is acceptable to me. He is very lovable when he takes on my critics and though not cuddly likes to huddle at my feet in photographs. He is a political animal with both “thuggish”muscle and “criminal”brain. If the Sri Lanka Govt. respects law the Minister should be taken into Police custody and questioned on his utterances. Will this happen. A name-sake inquiry was conducted by the SLFP Central Committee and the CID was to inquire into the Minister’s dealings in Kelaniya. Nothing has happened so far. The Minister continues. Are the people of Sri Lanka a bunch of idiots to be ruled by idiotic thinking? We look forward to having your ecstasy dealing, thug of a son in our hands. It is a shame you did not threaten him to mend his ways, rather than pick on some jounalists only doing their jobs. there will come a day or reckoning for you and your ilk. Any other country this would have been considered a public admission of guilt and prosecution would follow. In Rajapakse’s Sri Lanka… not a chance. This man has presented the first test to MR to prove his characteristic as the leader of a country rather than a man amongst the thugs on the street. It is on how he disciplines this mad Rottweiler, MR’s credentials as a reasonable neighbour/ citizen in a civilised society is going to be highlighted. The timing of this antique could not be worse. Sarath Fonseka publicly claimed that Tamils are second class but Tamils were asked to vote for the same Fonseka? What is the collective interest of the Tamils? Serving American and other white interests in Sri lanka? What’s all the fuss.He is only putting his doctorate into practice.He did a long thesis for his PHD on “goons and their effects on society”. If Dr.rajasingham narendran tries to put his learning into practice,everyone praises,but when Dr.mervyn silva does it there is an uproar.This shows the class divide in this country. Evil will triumph when good men keep silent. We need to push the UN for a Human rights office based in Sri Lanka to safe guard the public from lunatics. Evil will triumph when good men keep silent. Sri Lankans should push the UN to have a Human rights office based in Sri Lanka in order to protect the citizens from lunatics. 483. Whoever threatens another with any injury to his person, reputation, or property, or to the person or reputation of any one in whom that person is interested, with intent to cause alarm to that person, or to cause that person to do any act which he is not legally bound to do, or to omit to do any act which that person is legally entitled to do, as the means of avoiding the execution of such threat, commits criminal intimidation. A threat to injure the reputation of any deceased person in whom the person threatened is interested is within this section. WHAT EVER SAID AND DONE MERVIN SILVA IS A GOOD MAN.HE ACCEPTS WHAT HE AND HIS BOSS IS DOING.HE WILL BE APPOINTED NEXT MISINTER OF ANIMAL RIGHTS. I am not inclined to blame the likes of Mervyn for any reason. After all he has been elected by equally intelligent people and of course nurtured and tolerated by his superiors including the President. Let’s not break our hearts over these things. They are the ‘Do it yourself’ types. It is only a matter of time before they complete the process of ‘harakiri’ that currently being committed. The casualties though, the innocent people and the country. What must happen, however must happen if that is the destiny! My above comment about Mervyn is already appearing on various people’s facebook pages with out any attribution or links to your blog. Now I don’t care if my name was not mentioned, but I with these posters would indicate where it came from. I learn Mervyn was actually there in disguise intimidating, threatening and photographing traitors and was thrown out of the building by UN security officers. Is this man the reason why DJ is silent on MR/GR crimes? I think Sri Lankans should take a deep breath and chill out. Consider what happened. after watering down the resolution to bear-bones, the mighty US still cloud muster only 24 votes. which means that if it was any tougher, most likely it would not have passed. So if you think in that fashion, India did not make things easier for SL, but made certain that the resolution would pass by insisting that it be watered down. What does the 8 abstain votes mean? As this was something sponsored by the US, it means that 8 countries did not agree but did not have the courage to stand up on their convictions and vote no. So they took the easy way out. the fact that this one went down to the edge should tell US and EU that the time that they could dictate to the world is probably gone. if a tiny and insignificant country can put up a fight like SL did, I wonder where the real power lay at the UN. As for the three points of the resolution, what are the implications for GOSL? First two, were going to be met anyway so nothing new in those. The issue is the last one. will any self respecting government agree to go in front of a foreign body and explain how they will run their country? Has that ever happened in the past – may be someone can educate me. The resolution is non-binding and has no enforcing mechanisms. UNHCR can only recommend further actions in the event that GOSL decides just to ignore the resolutions. Any UN punitive actions can only come from the UN General Assembly or the Security Council. It is very unlikely that US and EU can get a majority vote in their favour against Sri Lanka in the UNGA – for years and years anti-Israeli resolutions have been passed in the UNGA over strident objections of US and EU. Nothing will get past in Security Council against Sri Lanka because Russia and China will not allow that with their veto powers. This is my very “non-expert” interpretation. So some people’s wet dreams of seeing Mahinda in Hague, economic sanctions or regime change in Colombo are just wet dreams. However, GOSL might do well to think of investigating the alleged human right abuses at the end of the war. Nothing sort of complete reversal of the current political situation in the country will ever placate the West, but some form of better accountability and good governance in Colombo will go a long way in making things easier for the country in the long run. colleague of Rajiva – a spokesman for Peace on TV. He just got his money extortion permit exteded. Mervin, Duminda…. these are untouchables protected by Rajapakshas. Would there be a bigger insult to war heroes???? When will such Ministers in MR’s cabinet as well as Karuna who killed 600 innocent Singhalese be called to answer? The Buddhist clergy demonstrated holding placards about the country’s 2500 yrs of dhamma. Our ambassador in Delhi bragged about SL’s 60 yrs of democracy. When will the common man see the benefits of this “inheritance”?? If there is no action taken, the the regime has still not learnt a lesson. When when oh when ??? Our gratitude and appreciation for Sunila Abeysekara, Nimalka Fernando, Dr. Paikiasothy Saravanamuttu and other brave Sri Lankans who tirelessly work towards human rights and dignity of all Sri Lankans – despite the dangers and tremendous odds against their work. The US sponsored resolution in Geneva primarily came about as result of the increasingly authoratarian direction of the Colombo administration which apppears to disregard the norms of the vast democratic world, US/EU/India/DownUnder and many others. If the Sinhalese nationalists truly beleive that they can resist the will of the democratic world, then the nation is heading for a dissastrous period. The Sinhalese must understand that the island’s ethnic problem is no longer a closet-issue as it was in the 50’s and 60’s. It has now being xposed to the whole world – and no right minded person would tolerate on-going practices of discrimination and bullying of minorities (such as athe banning of singing the national anthem in Tamil). With this reolution, the majority Sinhalese have been warned, it would be grave error to take it lightly. WOW – Rajapakse seems to under the thumb (or the big toe) of Mervyn! He manages to rule the Rajapakse Clan. We all are ware of his trip to the Canadian Embassy with a pistol, his roping of a government officer to a tree, his trip to Rupavahini, his trip to Munneeswaram Kali temple, complaints about him by the Kelaniya PS members, and so on. Of course, there are a lot of unsubstantiated, but apparently believable, news on drug trade, extortions, thuggery, etc. Now this! Honourable Rajiva and Honourable Dayan are regulars here. Their silence is really deafening!!! Mervyn is a thug, but he is our thug, this what MR clan thinks of him, no one better do these types of dirty works for them than this guy, he does this with a patriotic flavour and holding a prefix of Dr, and Ministerial portfolio. Mervyn was against animals’ slaughter in temple though, maybe UN has to form an animal rights forum if him to be represented, but Human rights for him, he would respect only when he be in opposition, while in ruling he would look for trees to tie Niladaries. You have have said, what I implied, beautifully. Great. Thanks. well need we say more about the regime,if the minister can talk like that after all that happened during a time of peace and is not arrested how on earth can we expect justice for excesses committed by the SL Armed forces whether it be in 2009 or in 19888-89 period. Bravo ! Well said ! There are 2 cardboard heroes in the cabinet resembling clowns…. MS & WW. Send them both to UN right now so they can smash the building and HR commissioner and BKM !! people voted for him,do not blaim no other people got what you wanted and deserve to go ahead with persons like him. DBSJ is spot-on in comparing Dr. Mervyn to a Rottweiler. Rottweiler is a vicious dog and is banned in many parts of the United States, including the State of Florida. His viciousness is only revelled by the Pitbull, which is banned in some parts of Canada, including the Province of Ontario. My experience has been otherwise. I have been a ‘dog lover’from my childhood and later as a graduate in Vetrinary Science, I have seen many dogs, of various breeds. In recent times I have reared two Rottweilers and think they are the best. The issue is how one rears them and not what is inherently wrong with them. Their intelligence is superior to the German Shepard/Alsation. Extreme intelligence, in the abseence of good rearing and discipline can of course turn into delinquency, as in humans. He wants to not only share my bed, but have a pillow as well! It just struck me that this is an ideal opportunity to scientifically test DBSJ’s theory that ‘Dr’ mervyn is genetically closest to a rottweiler. Dr Narendran should invite ‘Dr’ mervyn to share his bed for a couple of nights and see whether he is behaving like his rottweiler.If in the middle of the night mervyn gives him a couple of lovable licks on his neck,then DBSJ is right and indeed he is a rottweiler,but if Dr.narendran suddenly feels hands on his throat and his life slowly ebbing away as he is choked,then DBSJ is wrong,and mervyn is not a rottweiler,but a homicidal maniac. This is mervyn silva acting as dutugemunu in a film.He fell off the elephant and injured himself badly.The elephant was a descendent of dutu’s elephant ‘kandula’ and resented bogus dutu mervyn on his back. A leaked US embassy cable reviled “drug kingpins in Sri Lanka have political patrons in the government”. “Chief among them Dr. Mervin Silva, a Member of Parliament and the Minister of Labor” the cable further said. The Colombo Telegraph found the cable from the Wikileaks database. The remarks by Washington’s embassy to Sri Lanka, are revealed by the Wikileaks leaked cable. The cable was classified as “ CONFIDENTIAL” by ambassador Patricia A. Butenis. is troubling because of illicit network’s destabilizing effects. The February 18 arrest in the Muslim – dominated northwestern region of a Muslim man from an internally displaced persons’ camp suggests the potential for criminal exploitation of a vulnerable community. The cable further says “ according to a former Sri Lankan security services official, drug kingpins in Sri Lanka have political patrons in the government, chief among them Dr. Mervin Silva, a Member of Parliament and the Minister of Labor. His son, Malaka Silva, is suspected of trafficking the drug “ecstasy” in Colombo.